Nestled in the foothills of the Himalayas, away from the city’s hustle and bustle, Haridwar is a small town in the Indian state of Uttarakhand. Known since ancient times for its importance as a Hindu pilgrimage site, it is here the Holy river Ganga after circumventing 250 km in the Himalayan ranges enters the mainland India. Most famous for its beautiful ghats named as Har ki pauri Haridwar is frisked round the year by the seekers of spirituality. 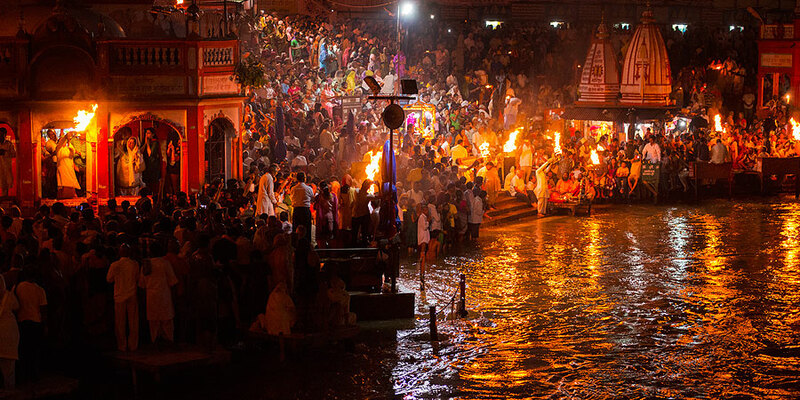 It is during the sunset hours, each day when the entire ghats of Har ki pauri sees a flock of worshipers from around the world gathering to, witness the grand Aarti procession of River Ganga. The ghats of the river Ganga is lit up with thousands of earthen clay pots or diyas and the whole town resonates during the Aarti, with the sound of the chants for the holy river of Ganga. 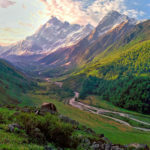 Haridwar also serves as the gateway for most of the famous trekking destination in Uttarakhand like Auden Col’s Pass, Kalindi Khal trek, Roopkund Lake trek and Kauri Pass to name a few. People usually make Haridwar the base station to meet and collect rations for their outgoing trekking expeditions. 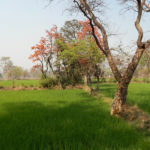 It reason why, off late this sleepy town of Haridwar has started getting steady inflow from another genre of people called, the Adventurer seekers or otherwise the Adventurer Junkies. Also serving as the gateway for various trekking destinations, the city of Haridwar provides an array of adventure activities of its own. Its for the people who are otherwise inclined towards a quick adrenaline rush and for those there is no need to fork out a lengthy week long paid leaves. The city has become a favorite for the weekenders who look out for nice and quick getaway to meet their adrenaline surge. 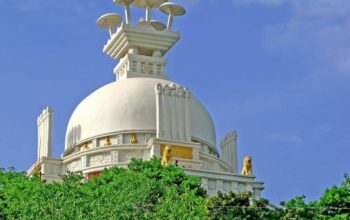 Haridwar city lines are dotted with many adventure groups and agencies which organizes round the year adventure activities like River Rafting, Bungie Jumping, Zip lining etc. Currently there is no dearth of agencies who are willing to meet the rising demand. Some have been in this business since many years and have built up a huge reputation. Of course the zeal of local government, the serene beauty and hilly surrounding area has immensely contributed to its exponential growth. It is because of these many factors Haridwar is now touted as ‘the’ next adventure capital of the country. 1. Bungee Jumping : Arguably the most famous must do activity and the most soul satisfying experience of feeling the G force right on your face is ‘Bungie Jumping’. You just have to tie yourself with a elastable rope and jump off a elevated romp from a height of 90 meters. It’s just that simple,technical description apart. This time tested activity, has constantly evolved into one of the most safest and sought after extreme sports. The minimum allowed age is 12 years. Where to do Bungee Jumping in Haridwar ? Jumpin Height, is the clear leader for this extreme sports. They claim it to be 100% safe which is being conducted by jump masters from New Zealand. 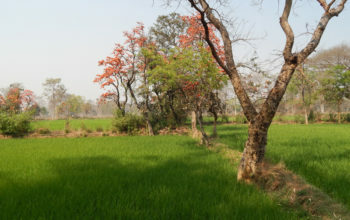 To reach there one just have to drive to their place at Mohanchatti, which is at 25 kms distance from the Haridwar city. Prior to that you need to book your suitable jumping slots at their booking offices on Badrinath road and then hire a shared vehicle to reach to their site at Mohanchatti. COST PER PERSON STARTS AT Rs 3500. 2. Giant Swing : It is for those who have a weakening toes to do the Jungee Jumping. The Height remains the same i.e 90meters but the the experience is unparalleled. It can also be done in tandem where the thrill is just the double. Where to do Giant Swing in Haridwar ? It is at the same place where Bungee Jumping is done. The Jumpin Heights premises at Mohanchatti, 25 kms from Haridwar this extreme sport called Giant Swing is done. 3. Flying Fox : Another adventure sports which can be done in tandem or in single is the Flying Fox. Here you will need to Zip line a 1 kms long cable to feel the adrenaline rush of flying where the speed can go up to 140 kmph. Where to do Flying Fox in Haridwar ? It is at Jumpin Heights when you can also do this extreme sports of Flying Fox. 4. 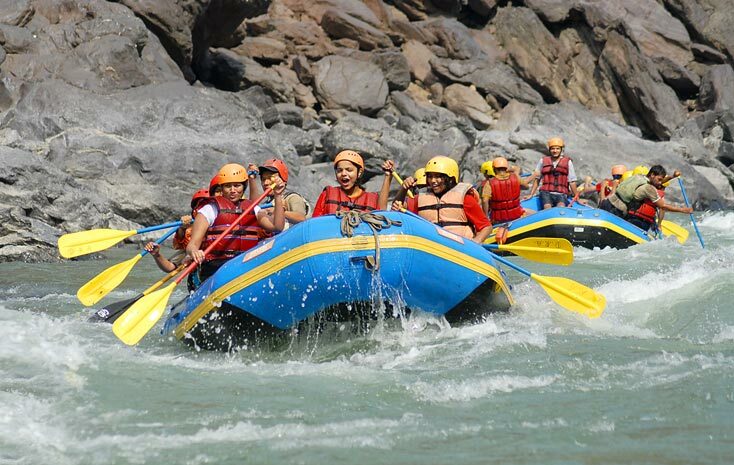 River Rafting : As like most other adventure activities , River rafting is the most famous and sought after activity in the Himalayan Region. 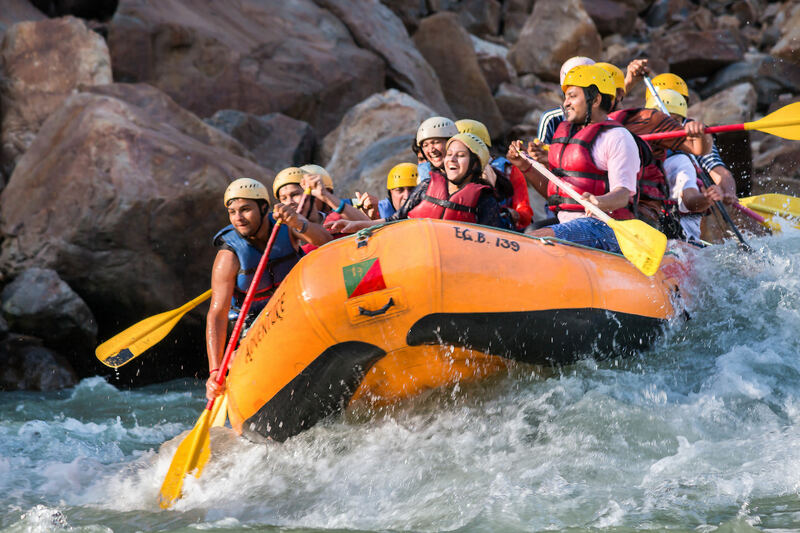 The mighty Ganga river offers some of the best river rafting experience in the region where at some points you can experience the thrill of rafting on grade 3 to grade 5 of white water rapids. Where to do River Rafting in Haridwar ? Drive down to the Shivpuri/Kaudiyala some 60kms away from Haridwar on the road to Rishikesh , You will find a whole lot of govt approved and safety certified rafting agencies offering various packages as per your suitability and no of people. 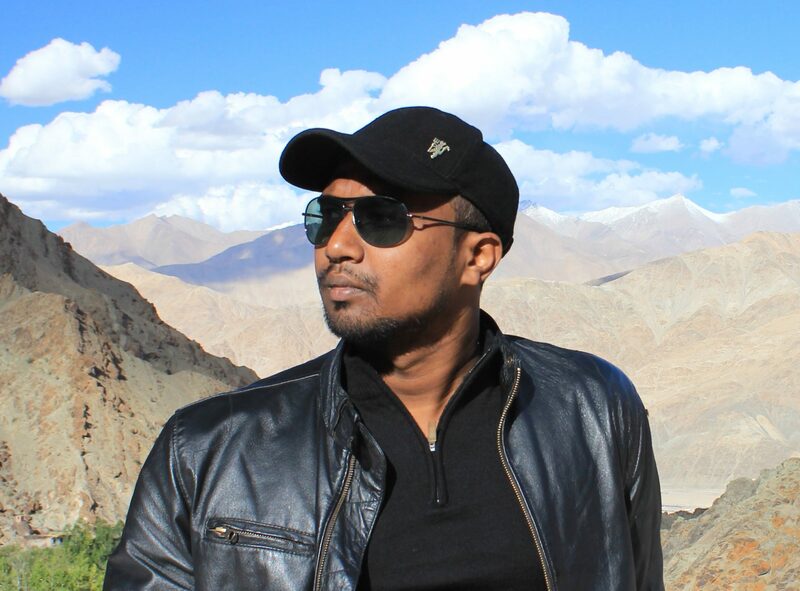 My experience with Expedition India was good . COST PER PERSON STARTS AT Rs 750. 5. Rapelling : The activity of Rapelling is yet another adventurous yet stirring sport that can be tried out when you are in Haridwar/ Rishikesh. It is a gruesome rock climbing session where you will learn the basics of this adventure activity. The enthusiasts will have to participate in, day trekking all the way to the Kunjapuri Peak where you will get a superb view the serene and lofty hills. This activity is done under the expert guidance for a secure and exciting experience of Rapelling. 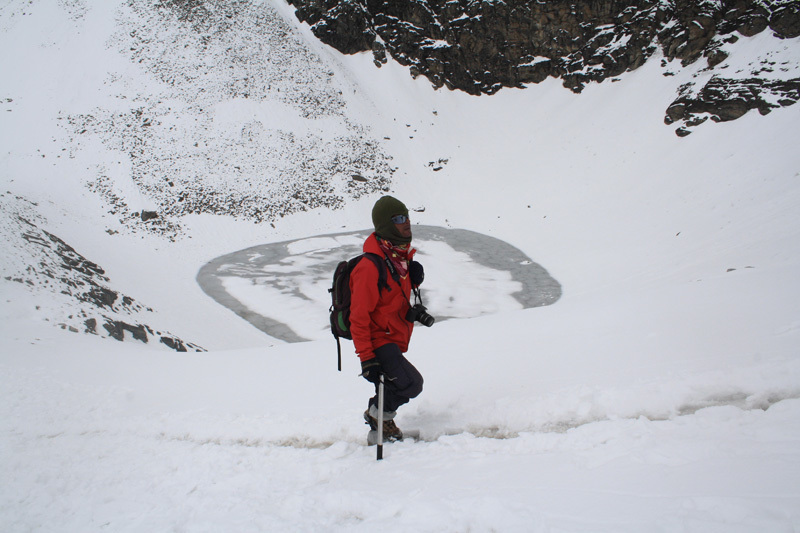 Equipments along with all the necessary equipments like gloves, harness, slings, ropes and helmet are provided to each. The sports demands dare and strength. Of course the thrill will be unlimited . COST PER PERSON STARTS AT Rs 1500.